A group of dental students from Plymouth University Peninsula School of Dentistry, supported by the Peninsula Dental Social Enterprise, have visited Ford Park Primary School in Plymouth to help pupils there achieve good oral hygiene. The project is part of the Inter Professional Engagement (IPE) element of the students’ studies, which sees dental students working with a variety of groups within the community to raise awareness of good oral health practices and improve access to dental care. 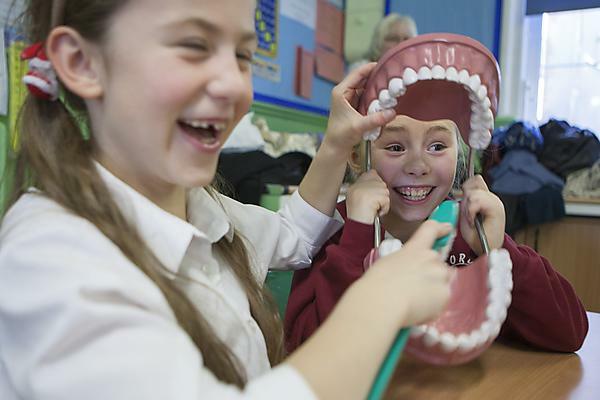 At Ford Park, they created a number of fun activities to help pupils understand more about their own oral health. These included games, a catchy brushing song to learn, as well as dressing up as a dentist and learning more about teeth using models and puppets. The project comes at a time when there is heightened concern about poor oral health diet and obesity in the very young. Earlier this year, in its first report on the oral health of three-year-olds, Public Health England stated that 12 per cent of children of that age were reported to have experienced dental decay. Last month NICE issued guidance for schools and nurseries about brushing children’s teeth, and dental treatments remain the most common reason for children to be admitted to hospital – more so than for tonsillitis.